There are as many great Simpsons gags as there are cats for the Crazy Cat Lady to throw at you. And so I turn to the internet (I think she's talking to you) for your greatest of all time. I am starting the list with these... and, really, I almost can't rank them... its like picking which of your children you love more. Vote! ( btw, Simpsons clips are taken down from YouTube all the time by Fox ). The FBI is coaching Homer on his new identity for when he goes into the Witness Relocation Program. FBI Man #1: Tell you what, Mr. Simpson, from now on your name is Homer Thompson, at Terror Lake. Let's just practice a bit, hmmmm? So when I say hello Mr. Thompson, you say hi. FBI Man #1: Hello, Mr. Thompson. 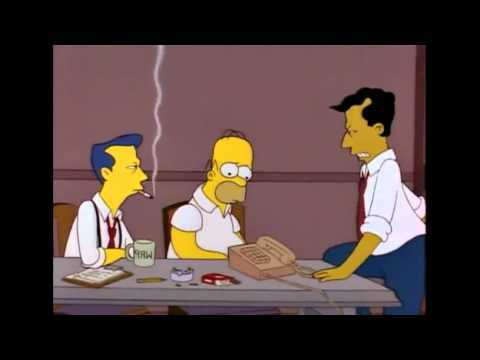 FBI Man #1: Now, remember, your name is Homer Thompson. FBI Man #1: [frustrated] Argh... Now when I say "Hello Mr. Thompson" and press down on your foot, you smile and nod. Homer: [whispering to the FBI man next to him] I think he's talking to you. Is it about my cube? Homer Simpson: Okay Mr. Burns Here are your messages: "You have thirty minutes to move your car." "You have ten minutes to move your car." "Your car has been impounded." "Your car has been crushed into a cube." "You have thirty minutes to move your cube." Homer Simpson: [Phone Rings] Hello? Mr. Burns: Is it about my cube? After noting that Homer seems horribly ill, Marge asks Homer if he's been eating a certain sandwich. Flashback to the company picnic, where a large submarine lays on a table. Carl talks to Homer. Carl: We hardly made a dent in that ten-foot hoagie. Homer: I'll give it a good home. Marge: You've been eating that sandwich for over a week. I think the mayonnaise is starting to turn. Homer: Two more feet, and I can fit it in the fridge. Marge: Homer, I found this behind the radiator. I really think you should throw it away. Homer: Marge, I'd like to be alone with the sandwich for a moment. Marge: Are you going to eat it? Homer gets both his hands trapped inside two vending machines in the plant after work hours. After being trapped for hours, the firemen arrive. Homer: (plaintive) They'll grow back, right? Fireman 1: Oh, er, yeah. Fireman 2: Wait Homer, are you just holding onto the can?